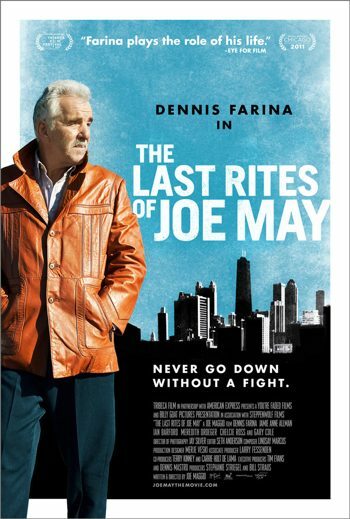 Written and directed by Joe Maggio, “The Last Rites of Joe May” is a deeply emotional, high quality movie − one that reminds us that special effects and fast paced action aren’t needed when the script, acting and direction are all solid. In fact, an over-abundance of chase scenes, explosions and other such distractions are, quite often, a direct correlation to the true quality of the script. That’s not to say that all action packed movies are bad, or that all low concept movies are good, but in the case of “The Last Rites of Joe May,” the theory holds true. Although at times predictable, Maggio has written a moving script. Joe May is a character not easily forgotten. In this gritty, character driven movie, veteran actor Dennis Farina (“Bottle Shock” 2008) plays the title character, a short-money hustler whose best days (if there ever were any) are behind him. Farina executes a first-rate performance, the portrayal of a once resilient man, always waiting for his big break, whose hardships are finally beginning to wear him down. Filmed in Chicago, the film opens with Joe being released from the hospital after seven weeks of battling pneumonia. Before leaving, Joe takes care to scrutinize his appearance, primping like a schoolgirl preparing for her first date. Joe lives by the ‘never let them see you sweat’ philosophy; appearance is of the utmost importance. His first stop, the local bar. Next, his apartment, which he soon finds out, is no longer his. With no sign of Joe for almost two months, the landlord, along with most everyone in the neighborhood, thought he was dead. The apartment, the place Joe called home for forty years, has been leased to a single mother (Jamie Anne Allman, AMC’s “The Killing”) and her young daughter (Meredith Droeger). Most of his belongings have been trashed. So begins Joe’s downfall, or perhaps just the acceleration of a lifetime of free falling. One small stroke of luck for Joe is the kindness of the new tenant, Jenny. Since she is strapped for money, she offers to let him stay at the apartment if he will help pay the rent. He jumps at the opportunity, but with only $400 to his name, Joe must get back in the game quickly, which proves to be a more difficult task than he imagined. Little does he or Jenny know that she will also provide him a last shot at redemption. Allman is affecting in her role as Jenny, a woman whose abusive boyfriend uses her past mistakes to his advantage. Viewers will love to hate Ian Barford as Stanley, the less than stellar boyfriend who happens to be a Chicago cop (not one of their finest). Jenny tries hard to believe her own words when she tells Joe that Stanley ran into a fire, “to save a lady and her kid. How many people do you now that would do something like that?” A superb actor, Allman can say more with 5 seconds of facial expressions than I can say in the text of this review. Jenny and Joe don’t have much in common, but Jenny’s daughter, Angelina, who warms up quickly to Joe, links the two. Farina and Droeger have a nice rapport on screen and their scenes together are comical and touching. Gary Cole (“Pineapple Express” 2008) gives a convincing, subdued performance as Joe’s go-to kingpin, Lenny. He views Joe as an annoyance, telling his buddy, “You wanna’ get rid of a loser, you lend him five bucks and you’ll never see him again.” The final scene of the movie features Lenny and is among the best I’ve seen, subtle, yet powerful. Bottom Line: Farina gives his all and is perfectly suited for the role of Joe May. The supporting cast is strong, the musical score haunting, and the slow-paced story, although sometimes predictable, is significantly poignant and should leave a lasting impression.